*Last night, Monday April 11, I was lucky enough to be invited down to the Pranna resteraunt on Madison Ave and 28th street by the industrious ladies of the 135th St Agency (PR firm) to meet the lovely Braxton sisters and their rock strong mother. Though I was the last to arrive due to traffic, my tardiness had a rare fortuitous effect. I was sitting within arm’s length of everyone except Tamar Braxton, the young firebrand who would be a star in her own right, and Momma Braxton who sat at the end of the row. And I’m not talking about one of my arm lengths either, because I have quite the wingspan. I’m talking about the considerably less pronounced wingspans of Toni, Towanda, and Traci. Though the women were there to promote their upcoming show Braxton Family Values on WeTV, Toni and the gang weren’t hesitant in veering off to talk about other subjects of interest. The conversation steered towards Trina’s alcohol abuse, Mom’s divorce after 35 years, Towanda’s open marriage (How YOU doin’? ), Tamar’s own superstar aspirations and much more. Braxton Family Values is as real as it gets in reality televison. Toni and I talk at length about her fight with lupus, parenting an autistic child and discussed my own child, who is also autistic. Though I could be wrong, I had the slightest inclination that the ladies gave a damn about the plight of my children. Again, I could be wrong and if I am then they all should be actresses instead of singers because they had me fooled. EURweb will feature those interviews in their entirety as soon as the interview tapes are transcribed. 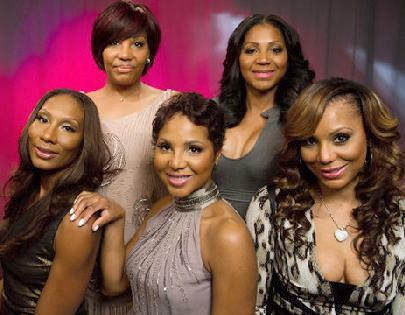 In the meantime, tune in to WeTV and check out Braxton Family Values tonight at 9/8c. that one on the the left, toni’s right, looks like she didnt pay her bills on the braxton looks and the bank foreclosed on her ugly behind…..
Got’ damn they are some beasts…Toni and her cockeyed self is the pick of the litter among them pound-puppies!!! yikes!! “Though I could be wrong, I had the slightest inclination that the ladies gave a damn about the plight of my children. Again, I could be wrong and if I am then they all should be actresses instead of singers because they had me fooled.”….huh? what had happened? this sentence dont make a dayum bit of sense. are you mad cause they didnt seem to care about your child or are you happy they did? sounds like you have a drinking problem worst than toni’s sister based on how this article is written.